BERLIN (Reuters) - Germany's spy chief has warned that Russian hackers are pelting his country with disinformation that could undermine the democratic process, echoing concerns already voiced by his domestic intelligence counterpart. Bruno Kahl, the new head of Germany's BND foreign intelligence service, compared the campaign in an interview published on Tuesday to misleading reports on social media before Donald Trump's election as United States president. The interview appeared in Munich's Sueddeutsche Zeitung as German officials puzzled over the source of a major disruption on Monday of internet traffic on Deutsche Telekom, the country's largest telecoms operator. "We have evidence of cyber attacks that have no other purpose than triggering political uncertainty," he added. "The perpetrators are interested in delegitimising the democratic process as such, no matter who that subsequently helps." 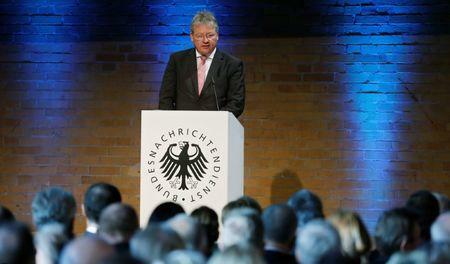 "These attempts to interfere focus on Europe, and on Germany especially," he said. "A kind of pressure is being exercised on public discourse and democracy here, which is unacceptable." The head of Germany's domestic BfV intelligence agency said earlier this month that authorities were worried that Russia may try to interfere in Germany's elections next year by using misleading news stories. German Chancellor Angela Merkel has said she could not rule out Russia interfering in the vote through Internet attacks. Last week, she also warned that "bots" - software programs that bombard media websites - might manipulate public opinion by spreading fake news. Some critics say a proliferation of fake news helped sway the U.S. election in the favor of Republican Trump, who has pledged to improve relations with Russian President Vladimir Putin. Defeated Democratic candidate Hillary Clinton accused Trump of being a Putin "puppet". "There is much to suggest that attacks in the past, for example on the German lower house of parliament were initiated by Russia," he said. De Maiziere said Germany was exposed both to "technical attacks" like those on infrastructure and to "intelligent attacks" that can manipulate opinion. "Behind every opinion, we want there to be a person and we need to explain who is driving these attacks, how they come about and what affect they have," he said.